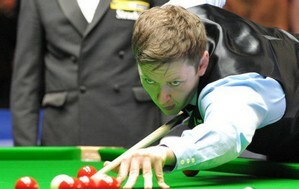 Judd Trump, Neil Robertson, Ricky Walden and Mark Allen are the final four of UK Championship 2011. None of them have ever won a UK title, so we will have a new winner this year. Judd Trump is the first man through to the semis, he beaten Stephen Maguire by 6-3. Trump lead Maguire with two centuries by 5-1 but Maguire trailed to stay in the match 3-5. Trump did not do Maguire a favour and end the match with his third century of the match, 120 to book his place in semi-finals. Trump said: "I want to play naughty snooker. It's a hard thing to describe and define. All I can say is that sometimes when I play a shot I just know it was so good it was a bit naughty. "It's great to be the favourite, I don't feel any extra pressure. Playing Neil will be tough, he creates a lot of chances with his long potting and I have to be better. Following talk of retirement from Ronnie O'Sullivan and Ali Carter this week, Trump also joked that: "this tournament will be my last so I want to go out on a high!" 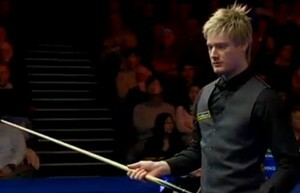 Neil Robertson followed Trump's footstep to book the second place in semi-finals. He beaten China's Ding Junhui by 6-2, thanks to the key important frame six to help him being ahead of Ding 4-2. "Ding is one of the best players, but you know what he is going to do," said Robertson, who has won six ranking events and never lost a final. "He is predictable. With Judd you just do not know what is going to happen next on the table. Ricky Walden saw off Shaun Murphy by 6-3. A break of 55 helped put Walden 4-2 up, and he added frame seven after Murphy missed a sitter of a green when poised to clear up. Another error from Murphy early in frame nine let Walden in for a calm 71 which saw him into the UK semis for the first time. Walden said after his victory, "Towards the end I was trusting my cue action but I was a bit nervous. It does help that I've won a tournament before because I can draw on those memories, especially as I have beaten the top players in the past. It means everything for me to get to the semi-finals because I've been working hard throughout my career. I still want to go further." 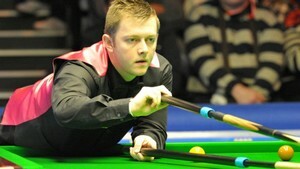 Mark Allen beaten Hong Kong's Marco Fu to join the other three boys in the semi-finals. Allen was once 4-2 up on Fu but Fu took the next three frames to go 5-4. 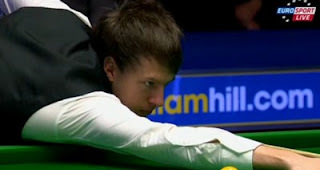 However, the calm and solid break-building helped Allen to force a decider and even win the match. Allen reached the semi-finals for the second consecutive year. Allen will play Walden in the semis, "Ricky is playing well, he is a tournament winner who has shown he can play well on the big occasion." The semi-finals will be best of 17 which play in two sessions instead of the best of 11.